In March, The Emperor's Bridge Campaign stumbled upon an image of a handwritten note from Emperor Norton that had been sold at auction in October 2012. The manuscript was undated and was sold as such — but the note was addressed "to the Ladies' Fair of the German Benevolent Association." With this clue as a point of departure, we undertook to try to learn more about the note — including exactly when it was written. We published this research here. The "Ladies' Fair" in question was an 8-day event produced between 26 February and 5 March 1878, to help raise funds for the building of a new German Hospital in San Francisco — the previous German Hospital in the city having been destroyed by a fire. We postulated that the Emperor penned his note around the time of the Fair. A couple of weeks ago, we received some wonderful new intelligence about all this from Scott Brown, the co-owner of Eureka Books, in Eureka, Calif. It turns out that the Ladies' Fair produced a daily souvenir newspaper — called The Daily Fair Report. In the course of Scott's work as a dealer in antiquarian books and ephemera on early California, a bound volume of all eight editions of this paper has come into his hands. Scott wrote to let us know about the historical existence of the paper and, specifically, about his discovery of something in the paper's pages that appears to bolster the Campaign's previous research into the Emperor's note. Front page of The Daily Fair Report, vol. 1, no. 5, Saturday, March 2, 1878. The Report was a souvenir paper produced during the German Ladies Fair held in San Francisco from 26 February to 5 March 1878, to help raise money for the building of a new German Hospital in San Francisco after the previous German Hospital was destroyed in a fire. Image courtesy of Scott Brown of Eureka Books, in Euke, Calif. Above is an image of the front page of the 2 March 1878 edition of The Daily Fair Report. A short German-language article in this edition highlights the Fair's "Autographic Album" — and commends this as an attraction worth seeking out. More than a wedding guestbook-style list of signatures, the Album was a collection of handwritten letters written to the Fair by dignitaries of all sorts, including President Rutherford B. Hayes and — as noted in the article — Emperor Norton. It seems quite possible that the note we "wrote up" in March originally was a part of this Album. Here's an image the article, followed by the German text and and an English translation that we commissioned. 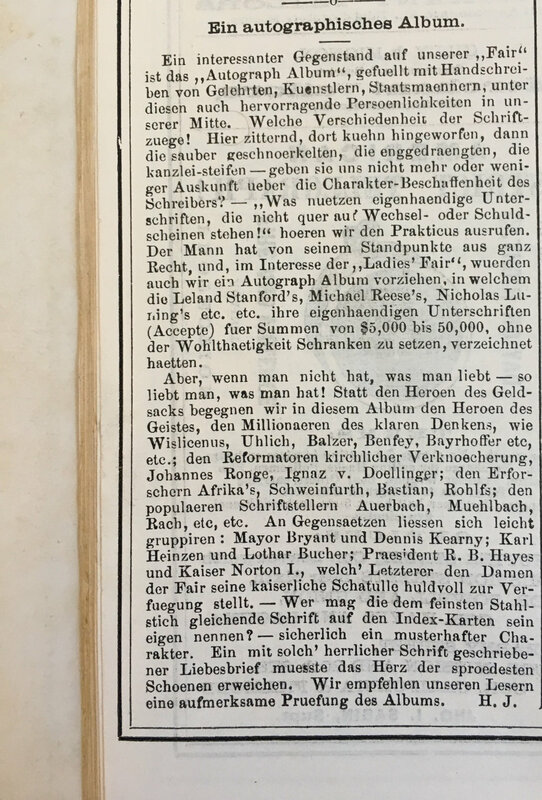 "An autographical album," article in The Daily Fair Report, vol. 1, no. 5, Saturday, March 2, 1878. Image courtesy of Scott Brown of Eureka Books, in Euke, Calif.
Ein interessanter Gegenstand auf unserer "Fair" ist das "Autograph Album" gefuellt mit Handschreiben von Gelehrten, Kuenstlern, Staatsmaennern, unter diesen auch herrvorragende Persoenlichkeiten in unserer Mitte. Welche Verschiedenheit der Schriftzuege! Hier zitternd, dort kuehn hingeworfen, dahn die sauber geschnoerkelten, die enggedraengten, die kanzlei-steifen — geben sie uns nicht mehr oder wineger Auskunft ueber die Charakter-Beschaffenheit des Schreibers? — "Was nuetzen eigenhaendige Unterschriften, die nicht quer auf Wechsel-oder Schuldscheinen stehen!" hoeren wir den Practikus ausrufen. Der Mann hat von seinem Standpunkt aus ganz Recht, und, im Interesse der "Ladies Fair", wuerden auch wir ein Autograph Album vorziehen, in welchem die Leland Stanford's, Michael Reese's, Nicholas Luning's, etc. ihre eigenhaendige Unterschriften (Accepte) fuer Summen von $5,000 bis 50,000 ohne der Wohlthaetigkeit Schranken zue setzen, verzeichnet heitten. Aber, wenn man nicht hat, was man liebt — so liebt man, was man hat! Statt den heroen des Geldsacks begegnen wir in diesem Album den Heroen des Geistes, den Millionaeren des klaren Denkens, wie Wislicenus, Uhlich, Balzer, Benfey, Bayrhoffer, etc., etc. ; den Reformatoren kirchlicher Verknoecherung, Johannes Ronge, Ignaz v. Doellinger; den Erforschern Afrika's, Schweinfurth, Bastian, Rohlfs; den populaeren Schriftstellern Auerbach, Muehlbach, Rach, etc., etc. An Gegensaetzen liessen sich leicht gruppiren: Mayor Bryant und Dennis Kearny; Karl Heinzen und Lothar Bucher; Praesident R. B. Hayes und Kaiser Norton I, welch' Letzterer den Damen der Fair seine kaiserliche Schatulle huldvoll zur Verfuegung stellt. Wer mag die dem feinsten Stahlstich gleichende Schrift auf den Index-Karten sein eigen nennen? — sicherlich ein musterhafter Charakter. Ein mit solch' herrlicher Schrift geschreibener Liebesbrief muesste das Herz der sproedesten Schoenen erweichen. Wir empfehlen unseren Lesern eine aufmerksame Pruefung des Albums. H.J. An interesting subject in our "fair" is the "autographic album" filled with handwritten letters from scholars, artists and statesmen, as well as exceptional personalities in our midst. What a variety of pen-strokes! Trembling here, thrown boldly there, then the neatly flourished, the narrow-stocked, the lawyer-stiff — does not each example tell us more or less about the writer's disposition? "But, what's the point of signatures in one's own hand when they not written across checks or promissory notes!" we hear the know-it-all cry out. The man is completely right from his point of view, and, in the interest of the "Ladies Fair," we too would prefer an autograph album in which Leland Stanford, Michael Reese, Nicholas Luning, etc., signed in their own hands for sums from $5,000 to $50,000, without having any limits placed on their benevolence. But if you do not have what you love, then you love what you have! Instead of the heroes of the money bag, we encounter in this album the heroes of the spirit, the millionaires of clear thinking, like Wislicenus, Uhlich, Balzer, Benfey, Bayrhoffer, etc., etc . ; the ecclesiastical reformers, Johannes Ronge, Ignaz v. Doellinger; the explorers of Africa, Schweinfurt, Bastian, Rohlfs; the popular writers Auerbach, Muehlbach, Rach, etc., etc. The following easily could be grouped as opposites: Mayor Bryant and Dennis Kearny; Karl Heinzen and Lothar Bucher; President R. B. Hayes and Emperor Norton I, the latter of whom graciously offers the ladies of the Fair the use of his imperial coffers. Who could compare his own writing on index cards to the finest steel engraving? — surely an exemplary character. A love letter written with such a magnificent stroke ought to soften the heart of the most prim beauty. We recommend our readers an attentive review of the album. H.J. "Instead of the heroes of the money bag, we encounter in this album the heroes of the spirit, the millionaires of clear thinking...."
Could there be a crisper summary of the Emperor Norton himself? * For German translation assistance, many thanks to Alexander Nowack, a friend of the Campaign in Berlin.